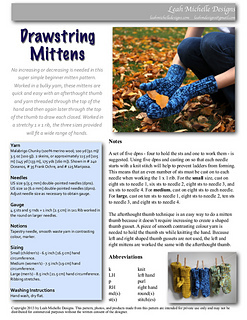 No increasing or decreasing is needed in this super simple mitten pattern. Worked in a bulky yarn, these mittens are quick and easy with an afterthought thumb and yarn threaded through the top of the hand and then again later through the top of the thumb to draw each closed. Worked in a stretchy 1x1 rib, the three sizes provided will fit a wide range of hands. Left and right mittens are identical. This easy pattern is worked in the round. It requires 2 skeins of Malabrigo Chunky or 115 (145, 175) yards (105 (133, 160) m) of any bulky weight yarn. Sizes: Small (children’s) - 6.5 inch (16.5 cm) hand circumference. Medium (women’s) - 7.5 inch (19 cm) hand circumference. Large (men’s) - 8.5 inch (21.5 cm) hand circumference. Ribbing stretches. Skills required: knitting in the round, picking up stitches (to close gap at thumb), stitches: knit, purl.